Over the past 2 years we've lived here I've tried to figure out just how to put in a garden when in fact there isn't a level spot of ground anywhere on our land. I managed a temporary garden one summer by planting in the landscaping area but once the real plants were ready to go in I was left without a space again. Another blip in my plans is that our home is basically built on the side of a mountain. We have about 1 or 2 inches of red clay and dust before you hit rock. While I could brainstorm a lot of ideas for putting in various kinds of gardens - from building an above ground on the hillside with one side higher than the other to keep it level, to beautiful plans for using landscaping rock to build planters, in the end my almost non-existent budget and my ability and muscle to get the project done made me brainstorm creative 'container' gardening instead. In the end, I pictured building some sort of low, long planters or box planters out of wood. I was dreading the cost and the work involved when I happened to be shopping at Sam's Club and saw a kit similar to this; Greenland Gardener Raised Bed Garden Kit. For the cost (about $60 with tax) I could have a quick and easy to-put-together frame with all the hardware I needed (very little) that already looked nice, wouldn't need to be painted or stained and would simply need to be filled. An added plus is if I wanted to make it taller than the 8" standard depth, two kits can be placed together to give a 16" depth. I found good quality soil on sale the following week (it takes about 12 bags) and waited for the weather to warm up. Because I was putting it on my deck there were a couple things I did that the average person installing it in their yard won't need to do. First; the deck was recently restained and I used a weatherproofing seal to ensure against water damage but it worked out well since I decided to put the garden on it. 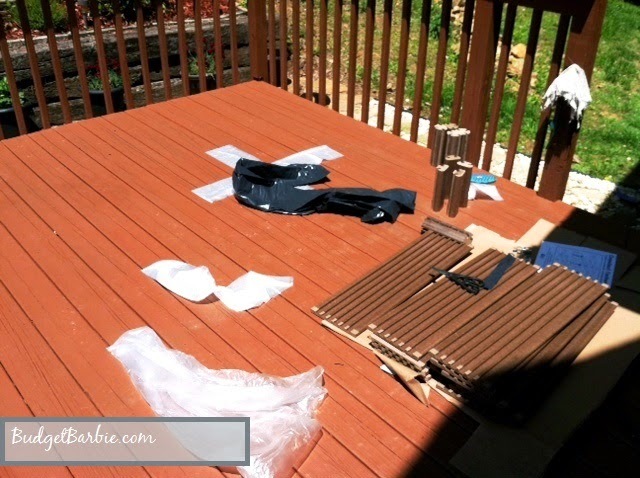 Second; I lined my garden kit to protect the deck. I used thick, industrial business style trash bags as they were actually thicker and stronger than the rolls of plastic we had on hand. I then used more plastic trash bags to line the edges of the frame. I left a few small openings between the bags where some drainage can occur but I also figured the lining would help my soil stay nice and moist during our hot, brutal summers. In the end, I'm thrilled with it. It goes together literally in minutes. I could have put it together in about 5 minutes had I not taken longer to line mine. I then hauled the soil up the hill to the backyard and filled the squares. Finally, I planted the seedlings I had started about a month ago in the house and then planted the rest by seeds. I'm very happy with the final result. The kit I bought (they have a few styles, as you can see in the links below this post) is 5 foot by 5 foot in 4 squares. It's 8" in depth and the kit boards are made from recycled plastic composite. The color is a nice neutral brown resembling wood.